Heiress Bunny Mellon didn’t promise us a rose garden. She gave us one. We would have been better off with more equality instead. Paul and Bunny Mellon shared a luxurious half-century. Let us pause now to pay our respects to Bunny Mellon. She died last week on her 4,000-acre farm in Virginia’s fabled horse country. But no tears, please. Bunny — nobody called her by her given name Rachel — lived a long and rich life. One hundred and three at her death, Bunny Mellon spent every year of her century-plus existence in luxury. Her grandfather had made a fortune off Listerine mouthwash. Her father ran the Gillette razor company. Bunny Mellon herself would become wealthier still. 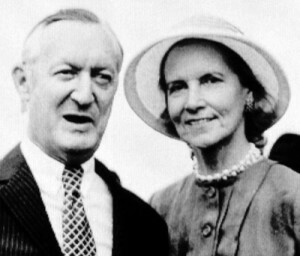 In 1948, she married Paul Mellon, the only son of Andrew Mellon, one of America’s richest men ever. Paul and Bunny would go on to share over 50 years together, mostly at their farm, a beloved spot that sported a mile-long private plane runway, a bronze statue of their Kentucky Derby winner, and a Mark Rothko painting worth over $100 million. For variety, the Mellons shuttled between an assortment of their other homes in Antigua, Paris, New York, Washington, Nantucket, and Cape Cod. Bunny Mellon represented the last link between American plutocracy past and present. But Bunny Mellon didn’t just frolic away her good fortune. She became, her obituaries all noted, a widely admired horticulturist and even expertly redesigned the White House Rose Garden for her dear friend Jacqueline Kennedy. One obituary last week described Bunny Mellon as “the last standing true American aristocrat.” Bunny’s life actually holds a deeper historical significance. At her passing, she represented the last link between America’s original plutocrats, the gang that ushered in the Great Depression, and our contemporary plutocrats, the crew that gave us the Great Recession. Mellon had her high-society debutante debut in October 1929, the same month as the infamous stock market crash. America’s top 1 percent was then collecting nearly a quarter of the nation’s income, a level the nation’s deepest pockets would not again match until Bunny Mellon’s last decade. Bunny’s life, in effect, saw the demise of one plutocracy and the rise of another. And that presents us with a bit of a mystery. How did Bunny’s mammoth family fortune survive the mid 20th century, a span of years that saw America’s other original plutocratic fortunes battered down by a 91 percent federal tax on income over $400,000 and a 77 percent estate tax on bequests over $10 million? Bunny’s father-in-law, Andrew Mellon, didn’t just hold a huge fortune. The answer: The Mellons had an ace up their sleeve. Bunny’s father-in-law, Andrew Mellon, didn’t just hold a huge fortune. He held enormous political power, as the longest-serving secretary of the treasury in U.S. history. Andrew Mellon entered the cabinet in 1921. He wouldn’t exit until 1932. Between those two years, Mellon did his best to undo the tax rates imposed on America’s rich during World War I. On his watch, the top income tax rate, 77 percent on income over $1 million in 1918, would drop to just 25 percent. Mellon despised the estate tax even more than taxes on high incomes. Mellon pushed hard to have the estate tax completely repealed. He wouldn’t get that repeal. Lawmakers slashed estate tax rates but left the tax in place. But Mellon did get his way on the “gift tax,” a low-profile accessory to the estate tax. Congress had enacted a gift tax to prevent the wealthy from sidestepping the estate tax by “giving” their money away to family and friends. Mellon in 1926 had this gift tax repealed — and then proceeded to take full advantage of its absence. He would quickly shower his dear ones with millions in untaxed gifts. Tax rebates added considerably to the wealth of the Mellon family. Mellon had another trick up his sleeve as well. He didn’t just maneuver to lower tax rates on high incomes. He quietly had his Treasury Department issue tax rebates to the rich for the high taxes they had paid before tax rates started falling. Mellon personally would pocket $21 million in personal and corporate refunds, the equivalent of over a quarter-billion dollars today. Mellon’s grand fortune, thanks to maneuvers like these, passed on largely intact to his nearest and dearest. In 1957, Fortune would publish a list of America’s wealthiest individuals. Half the top eight owed their wealth to Andrew Mellon. This immense wealth enabled Bunny Mellon to skate through America’s mid-century years. Her rich contemporaries found the going much more difficult. By the 1950s, newly restored high taxes on America’s richest had their grand estates turning into college campuses and suburban housing tracts. Not all the rich, to be sure, had such a hard time in the high-tax years right after World War II. Oil industry fortunes flourished mightily, fueled by a set of special tax breaks zealously guarded by the nation’s two most potent lawmakers, House speaker Sam Rayburn and Senate majority leader Lyndon Johnson. These Big Oil fortunes — with substantial Mellon heir cash on the side — would soon bankroll a new conservative political infrastructure and set the stage for the Reagan era’s wildly successful assault against high taxes on America’s richest. By Bunny Mellon’s golden years, that assault had completely recreated the plutocracy of her youth. She had outlived America’s equal years. Will the rest of us now outlive, the question becomes, today’s unequal ones?